The greater problem still, though, lies in the collaboration with Brecht, whose strengths are quite different, and whose adamant refusal to sentimentalise may sometimes be undone by Weill. (Not that Weill is sentimental as such, but his æsthetic is undoubtedly different, less didactic, unquestionably less concerned with alienation, more concerned perhaps with ‘opera’). It is no mean achievement of John Fulljames’s production of this difficult, perhaps impossible, work, that Brecht’s stature as, after Beckett, perhaps the greatest of twentieth-century playwrights comes across with increasing immediacy. There is no attempt to make us ‘sympathise’, although Weill sometimes does not help in that respect. The conceit, as with that of the work itself, is admirably simple, though certainly not simplistic. 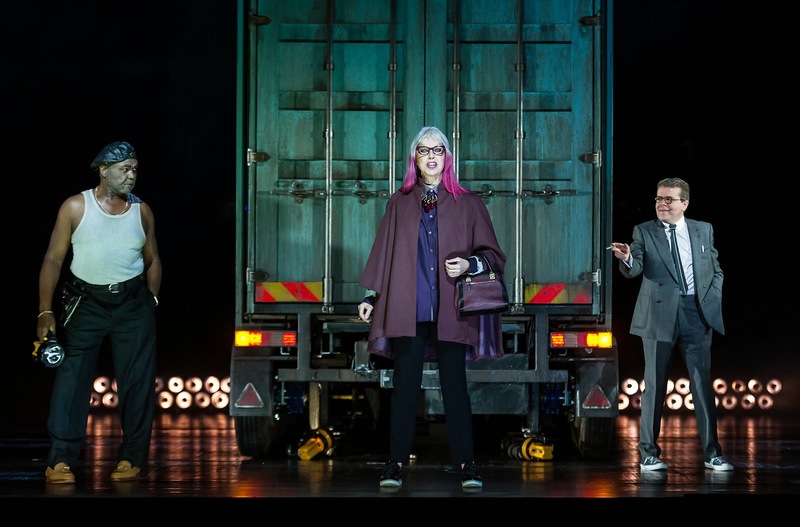 Mahagonny and Mahagonny grow from a splendidly designed lorry. The accoutrements of capital, of ‘entertainment’, of neo-liberal barbarism sprout necessarily: garishly, of course, but retaining focus. Voice-overs and video projections do excellent work, Brecht’s placards reimagined for our computer-screen-obsessed age. 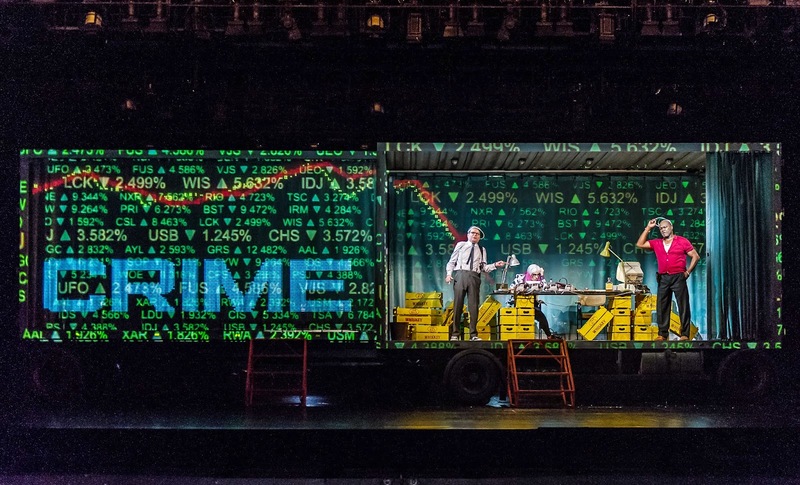 Perhaps the acting does not always convince as strongly as it might as acting, but that is part of the trade-off between Brecht and Weill: an immanent criticism as much as, perhaps more than, a shortcoming. Choreography is sharp and to the point, for instance during the ‘Mandalay Song’, as the men of Mahagonny – and what an indictment for us this is of male behaviour, the Widow Begbick notwithstanding! – await their turn with the prostitutes. I wondered whether the Christ-like imagery at the end was exaggerated, but to be fair, it is no more so than it is in the work. Besides, we are at liberty to interpret God’s coming to Mahagonny as we will. For, in general, the action is non-specific enough for us to be able to relate it to when and where seems most appropriate. (It would surely be bizarre, if in our age of bankster-crime run truly riot, we did not think of our own characters such as HSBC's The Revd Prebendary Baron Green of Hurstpierpoint, surely an invention who would have been too much, too far-fetched, too agitprop, even for Brecht.) Price variations do their evil work, and Fulljames, whilst not entirely ignoring the ‘American’ element, does not overplay it. Weill was certainly alert to the danger of the work seeming as if it were too much ‘about’ America, writing to his publisher: ‘The use of American names for Mahagonny runs the risk of establishing a wholly false idea of Americanism, Wildwest, of such like. I am very glad that, together with Brecht, I have now found a very convenient solution … and I ask you to include the following notice in the piano score and libretto,’ although, oddly, it would only appear in the full score, not in the piano score: ‘“In view of the fact that those amusements of man which can be had for money are always and everywhere exactly the same, and because the Amusement-Town of Mahagonny is thus international in the widest sense, the names of the leading characters can be changed into customary forms at any given time. The following names are therefore recommended for German performances: Willy (for Fatty), Johann Ackermann (for Jim), Jakob Schmidt (for Jack O’Brien) [etc. ]”.’ In an English-language version, we necessarily tilt more towards Americana – the exhibitionist piano-playing of Robert Clark is an especial joy! – but not too much. 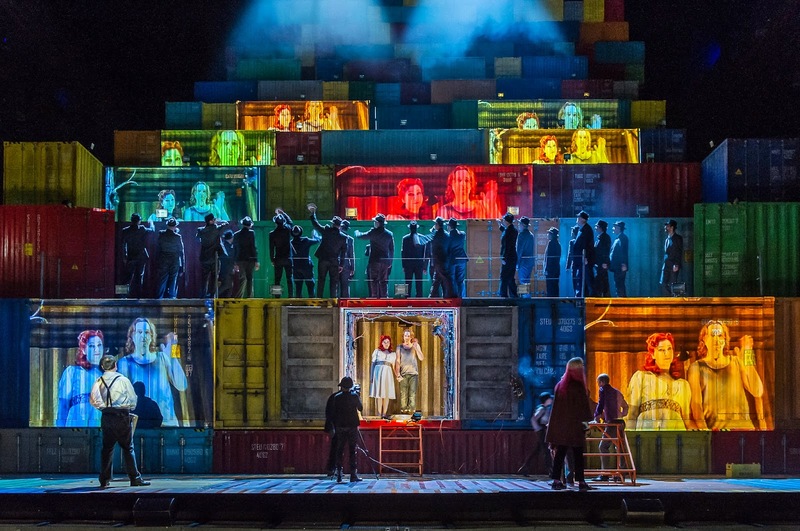 Moreover, whilst those of us with Lotte Lenya in our mind’s ear, may miss her and the rest of the Wilhelm Bruckner-Rüggeberg crew, we know that this is not a work to be confined to nostalgic conceptions of Weimar culture. 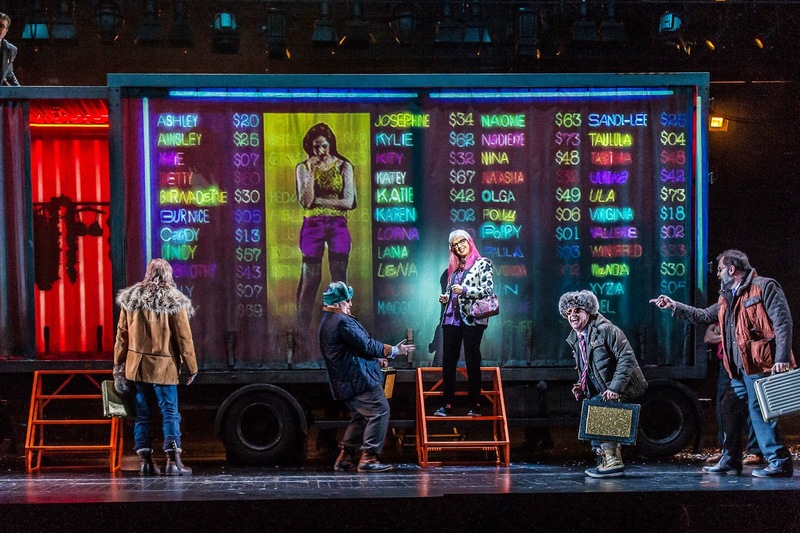 The tension between Brecht and Weill was perhaps most clear in the vocal performances. How to approach these roles as opera singers, in so large a theatre? For the most part, the cast coped well enough; if their performances fell somewhat uneasily between (at least) two stools, then perhaps that is unavoidable in a presentation of the work so conceived. Willard White balanced gravity and sleaze as Trinity Moses. Kurt Streit as Jimmy had his lyrical moments – but also, alas, his moments of would-be lyricism. Christine Rice’s Jenny veered uneasily between home-spun Oklahoma and operatic vibrato, but her transformations were not so blatant as those of Anne Sofie von Otter’s Widow Begbick. Stylistically, she was all over the place, but I assume that in some sense was the point. In any case, the whole, as the cliché has it, was more than the sum of its parts. At the time of its first performance, Adorno’s was one of the few critical voices raised in favour of the work: ‘Apart from the diametrically opposed operas of the Schoenberg school, I know of no work better or more strongly in keeping with the idea of the avant-garde than Mahagonny … Despite and on account of the primitive façade, it must be counted among the most difficult works of today.’ That difficulty may have lessened, as indeed has that of Wozzeck or Von heute auf morgen – now when shall we see that in London? – but it remains, the chill with which Brecht and Weill react against each other perhaps no less than ever.